Free Consultation & Design Estimates. Call Toll Free 1-888-507-7960. Celebrity Greens of St. Louis is the Authorized Partner and Designer and Installer of Artificial Grass, Artificial Turf and Artificial Putting Greens for the greater St. Louis, MO area. We lead the way in: constructing artificial putting turfs, supplying synthetic driving range materials, creating state of the art landscape projects, building safer, more durable playgrounds, and engineering indoor sports facilities. Anything you want to do with artificial turf, we can do! We stand behind our products 100 percent, and provide our customers the most extensive support in the industry. Offering only the highest quality, environmentally friendly, Artificial Turf products available! No job too big or small! 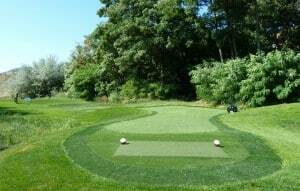 Our turf is the most realistic and durable turf on the market today. We are partnered with the best manufacturer and international leaders in the artificial grass lawn industry. Our exclusive relationship allows us to offer you the varieties of synthetic grass products that meet the highest standard in artificial turf manufacture, longevity and durability – Our customers have peace of mind and a beautiful yard or putting green. We install all sports surfaces, as well as certified playground surfaces, and we specialize in designing and installing the most advanced sand filled, artificial grass putting greens available today. Our Artificial Putting Greens can be installed indoors and outdoors. We offer a multitude of design features including sand traps, water hazards, custom lighting and many other amenities to excite the game of golf. Contact us today and let us work with you to design your dream golf green or replace your existing lawn with an Artificial Turf Lawn. If you are interested in a Playground, Play Area or Sports surface, we can do that too!